The contacts between the Arab Levant and the Christian Mediterranean increased not only because of the Crusades that began in the late eleventh century but also because of mercantile interests. The West was a culture of meat-eaters as well as grain, and the Arabs introduced culinary concepts based on lots of vegetables and legumes, such as those represented in the wide range of vegetable recipes. But in both the Arab Levant and the West, cereal crops began to recede by the mid-fourteenth century, mostly owing to the effects of the Black Death. The massive scale of death in both the Muslim and Christian Mediterranean led to the expansion of a sylvan-pastoral economy because of the reversion of farm land to pasture. This phenomenon manifested itself in two ways: the appearance of more meat on the peasant's table and the rising political importance of the butcher. The meat may have been dry-salted for preservation but it was still meat. This was particularly true in the hills, mountains, and upper plains where the diet had consisted almost entirely of vegetables because of the lack of area devoted to stock-rearing and hunting. The importance of meat is reflected in the relative political importance of the butcher. In Jerusalem of the sixteenth century, members of the butcher's guild filled the hisba office, one of the oldest institutions of the Islamic state, responsible for promoting good and forbidding evil as proscribed in the Koran (Sura 3: v, 100). The muhtasib, the head of the hisba office, inspected market activities and collected taxes, such as the "butcher's seal tax" guaranteeing the quality of meat. Jerusalem at this time was under Ottoman rule, and the supply of meat to the towns was an important facet of economic activity. Since butchers knew their meat, they often filled these positions as witnessed by their frequent mention in sijill records (Ottoman court documents). 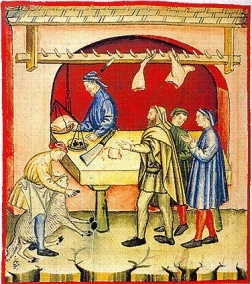 The butcher was also an important and highly politicized profession in fourteenth-century Provence. The covered markets of Provence were filled with small butcher stalls where they plied their trade over the counters of their taula, an Old Proven�al word for "table." The word taula appears to be adopted from the Arabic word for "table," although that word is thought to derive itself from the Italian word for table, tavola.